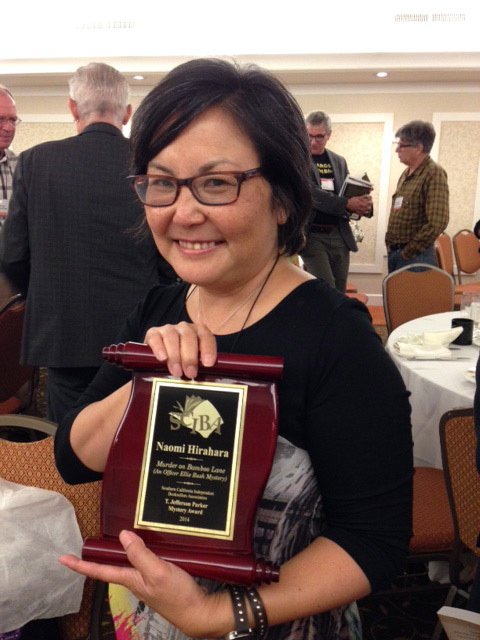 ‘Murder on Bamboo Lane,” the first in a new mystery series by Edgar Award-winning author Naomi Hirahara, was awarded the 2014 T. Jefferson Parker Award for best mystery by the Southern California Independent Booksellers Assn. at its annual banquet on Oct. 18 at the Beverly Garland Hotel in North Hollywood, Calif. The book, published by Penguin Berkley Prime Crime, follows the exploits of Officer Ellie Rush, a 23-year-old hapa bicycle cop for the Los Angeles Police Department. Other finalists were Drew Chapman (“The Ascendent”) and David Putnam (“The Disposables”). The retail price of the mass-market paperback and ebook is $7.99 each. For more information about Hirahara and her future events, visit www.naomihirahara.com. Congratulations Naomi! I can’t wait to read it!